TORONTO -- The Toronto Raptors have staked their claim as a favourite to come out of the Eastern Conference with a superb start to the NBA season. As good as they've been, they're about to get a test of whether or not they can hang with the best in the league. 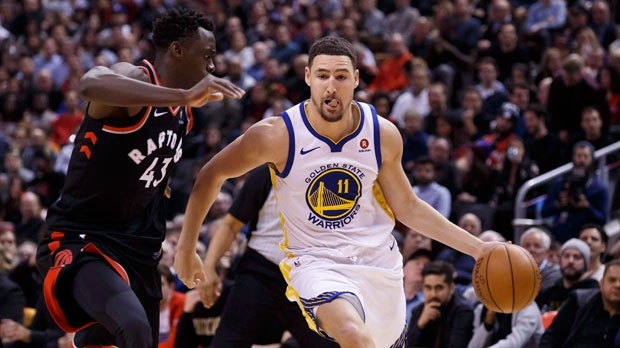 The Raptors will take a league-best 18-4 record into Scotiabank Arena on Thursday for an anticipated matchup with the two-time defending champion Golden State Warriors. The Raptors have been good in previous regular seasons, but the play of star forward Kawhi Leonard and guard Kyle Lowry and the depth of quality on the roster suggests this is a team built for the playoffs. And while the Raptors have looked steady so far this season, the Warriors have looked vulnerable at times thanks to key injuries and uncharacteristic infighting. The Warriors, though, have won three of the last four NBA titles, still have one of the best records in the Western Conference at 15-7 and haven't lost a game to the Raptors in years. The Warriors clearly have the edge in superstar mojo with an enviable wealth of big-name players on their roster. Steph Curry is a two-time NBA most valuable player, while Kevin Durant, a league MVP in 2014 before joining the Warriors, was named the Finals MVP in each of the last two post-seasons. Draymond Green is the 2017 defensive player of the year. Klay Thompson is a four-time all-star who combines with Curry to form one of the league's most formidable backcourts. Golden State's embarrassment of riches is set to grow in about a month, when four-time all-star big man DeMarcus Cousins expects to return from surgery to repair a torn left Achilles tendon. In Toronto, Kawhi Leonard is a two-time defensive player of the year and the 2014 Finals MVP, and Kyle Lowry is a four-time all-star. But otherwise the Raptors rely on effective rotation players such as Danny Green, Serge Ibaka, Jonas Valanciunas, Fred VanVleet, OG Anunoby and Pascal Siakam rather than superstar contributions. While the Raptors can't compete with the Warriors on sheer marquee talent, they may have the edge in depth. Toronto boasts long, athletic wings that can defend and score in Anunoby and Siakam. Ibaka and Valanciunas are combining to give Toronto elite-level production at centre. VanVleet provides a starter-calibre option off the bench at point guard. In Toronto's 122-114 comeback win at Memphis on Tuesday, Lowry was the only Raptor to score 20 or more points, but five of his teammates reached double figures. While Golden State has no shortage of weapons at its disposal, it's a thinner team on the bench than Toronto. Outside of dependable big Kevon Looney, it's somewhat of an inconsistent group that needs to patch holes through players like Alfonso McKinnie, who couldn't reliably find a place in the Raptors' lineup last season. The thin bench was exposed when the Warriors lost four games in a row earlier this month with Curry and Green battling injuries, and Golden State's three wins since have largely come on the backs of huge efforts from Durant and Thompson. The Warriors have owned the head-to-head series with the Raptors lately. Golden State has won eight in a row against Toronto, with the Raptors' last win coming at home on March 2, 2014. But the Raptors have given the Warriors a scare in recent meetings. Toronto lost by just two points the last time the teams squared off, falling 127-125 in a Jan. 13 game at what was then the Air Canada Centre. In fact, five of the Raptors' last six defeats to the Warriors have been by six points or fewer. Both teams know how to score with virtually identical offensive ratings. Toronto has the slight edge at 114.3 points scored per 100 possessions, with the Warriors at 114.2. Only the Milwaukee Bucks are more potent at 115.6. The Raptors have a statistically better defence that Golden State at 106 points allowed per opponent's 100 possessions, good for seventh in the league. Golden State is 18th with a defensive rating of 109.